Beginning in the 1960s, the moods of secularization ultimately led to society’s loss of shame. Attacks on Christianity and the church are rampant in today’s society. Unbelievers once revered the church and its teachings, but today they scorn them. Films such as The Da Vinci Code and organizations such as The Jesus Seminar attack the credibility of Jesus and the Bible. But how do Christians answer these attacks on Christianity? Few are as familiar with these attacks as is Ravi Zacharias, president of Ravi Zacharias International Ministries. For 36 years, Zacharias has travelled the globe engaging atheists, defending Christianity on secular campuses and proclaiming the truth through his writings and daily and weekly radio broadcasts. Zacharias talked with Enrichment Journal’s associate editor, Richard L. Schoonover, and discussed the issues facing culture and the church and how pastors and their congregations can respond to these attacks. What is destroying the moral and spiritual foundation of today’s society? ZACHARIAS: I believe a convergence of many factors has taken place. Much of education in the 1960s came unhinged from any moral absolutes and ethical values; to wit, the book, Excellence Without a Soul, by Harry R. Lewis. We have seen this happening throughout the last 40 years. There have been many voices alerting us to this. But more than just a philosophy took over; a mood took over. First, secularization generally held that religious ideas, institutions and interpretations have lost their social significance. People liked the idea of a secular society and a secular government. But in terms of moral values and ethics, they never checked into the internal assumptions of secularization that made it wide open to almost any view on any subject. Beginning in the 1960s, the moods of secularization ultimately led to society’s loss of shame. Next is pluralization, which sounds like a practical and worthy idea; and in many ways, it is. In pluralism you have a competing number of worldviews that are available and no worldview is dominant. But smuggled in with pluralization was the absolutization of relativism. The only thing we could be sure of was that all moral choices were relative and there was no point of reference to right and wrong. This resulted in the death of reason. Being spiritually minded was OK as long as people kept their spiritual beliefs private and did not bring them into the public arena. The irony of this was the fact that secularization—which had its assumptions on absolutes and anything of a metaphysical nature—was allowed into the public place. In fact, its very trust was to bring it into the public place. But anyone who believed in a spiritual Essence, an Ultimate Reality and the fact that there were transcendent absolutes that needed to be adhered to was told to keep those beliefs private. That ultimately paved the way for the loss of meaning. These three moods—secularization, pluralization and privatization—brought about loss of shame, loss of reason and loss of meaning. How was this authoritatively pontificated in the social strain? This is when philosophy stepped in, the moralizers against morality came in and political correctness came in. These gave society some parameters that allowed it to expel the moralizing from outside the secular realm. As a result, everything became pragmatic. Philosophers and naturalists stepped in. In this new century, we have lost all definitions of what it means to be human and what sexuality, life and the home are all about. We are on the high seas, battling the storms of conflicting worldviews without a compass. A shift is taking place in today’s society toward Christianity and the church. Explain. ZACHARIAS: The shift that is taking place is very calculated. Eastern religions are protected in today’s society because to critique Eastern religions is seen as culturally insensitive and prejudicial. But the Christian faith, which is the target of Western culture (but people have forgotten that it came from the East), is now the dartboard. Society can attack any aspect of Christianity. In the recent presidential primary race, it was fascinating to notice how pundits described Mike Huckabee as a former Baptist minister. The Judeo-Christian worldview is the target of the Western media. The media is the single greatest destroyer of the notion of absolutes and of the Judeo-Christian worldview, the only worldview that could justify the existence of a nation like America. They wish to stigmatize the Christian in a way that they do not need to say anything else. When I am overseas, I see these attacks in articles in the Western newspapers and in the journalism on television. I just returned from Thailand and Singapore. Every mall I walked through in those countries was playing Christmas carols. One of the world’s tallest Christmas trees was in Central World Plaza in Bangkok, Thailand. Christmas trees and Christmas decorations filled the streets of Singapore and carols were playing there. In America, Christians wonder whether they can even do this anymore without someone questioning whether they ought to acknowledge Christmas in the marketplace. What is the basis of this calculated attack? ZACHARIAS: I am not sure I can pinpoint it, but I think the symptoms of cultural decay were clear from the 1960s onward—changes in beliefs regarding sexuality and the right of a child to live in its mother’s womb. Those in the forefront of popularized Christianity took on these issues. These Christians were then attacked because society viewed them as inhibitors to progress and the freedom of other worldviews. The media does not realize how inhibiting some Eastern religions would be if they held sway in our society. For some reason, they think Christians are fair game, and they can attack the Christian worldview. Another reason for this attack is the conflicts that emerged on the moral landscape. Those who questioned this moral degeneracy were seen as coming from the Judeo-Christian worldview, and they had to be silenced. Allah, Samuel Harris, and Daniel Dennett were saying that inhibitions and prejudicial views on sexuality have come to us from the Christian worldview. Therefore, the Christian worldview is the enemy to be taken out. There is a proliferation of books and movies, such as The Da Vinci Code and organizations such as The Jesus Seminar, that are attacking the biblical and historical facts of Christ’s life, death and resurrection? Why? ZACHARIAS: I do not think this is accidental, and I do not think this is the end. Some of these will come and die natural deaths. They carry a limited shelf life because people have tried these tricks before. When philosophy and naturalism attacked the Christian faith and theistic worldviews in general, they started with an attack against the classical arguments of the existence of God. The cosmological argument—which argues from causality—states that everything that comes into being could not have caused itself and had to have something else to cause it. But there cannot be an infinite regress of these causes. Ultimately, you must stop at one uncaused being. Since nothing physical in this world seems to be uncaused, the only way to have an uncaused being is for that being to be spiritual. The cosmological argument went in the convergence of other lines to prove the existence of God. Suddenly, naturalists entered the fray and said, “Why does everything have to have a cause? Because everything has to have a cause, and itself would be the cause; therefore, it is self-defeating.” This is a complete misstatement of the argument. No one has said everything needs to have a cause. What we said was that everything that comes into being needs a cause, and nothing physical is uncaused. Everything has an explanation outside itself. That is how the argument should go. But somehow, David Hume, and others in the 1700s, challenged the causality argument until people grew tired of hearing it. Then we have the teleological argument that argues not simply from design, but to design. Any time you see intelligibility, a specified complexity, or an intelligent effect, you assume it had an intelligence and a cause behind it. Then naturalists proposed a random, subatomic world and argued against purposeful design. Thus, the design argument no longer works. So the moral argument was a thorn in their side. How could they do away with it? If you can make a Jesus who is just like us and immoral, then that argument is buried too. Naturalists took on the cosmological argument. I do not think they did damage to it, but they think they did. They also think they damaged the teleological argument. They, however, could not escape the moral argument. So books like The Da Vinci Code, The Gospel of Judas, and The Gospel of Philip came into vogue. These Gnostic writings were supposed to show that Jesus had some private moral issues. If they could sustain this perception, they could do away with the moral argument. It is amusing that they never went to the Qur’an or the Gita to look for moral flaws in the key personalities represented there. They would have found enough ground to show what the moral problems were. Instead, they attacked the Christ of the Scriptures, who is so pure, so pristine, and so demonstrative of everything that is pure and good. The Da Vinci Code taught that maybe Jesus had a secret life with Mary Magdalene. Some recent writings and findings have claimed more. If Mary Magdalene were everywhere these books claimed she was, she must have been superhuman. Otherwise, how could she be found in so many places at the same time? Why is the deity of Christ under attack? ZACHARIAS: If people can devein the gospel concerning the deity of Christ, then they have taken the gospel away from us. If they can attack Christ and make Him look like they want Him to look, then they are taking away the ultimate authority. Why is religious pluralism not philosophically possible? ZACHARIAS: Religious pluralism is a belief system that sounds good but does disservice to all religions. All religions are exclusive. Even naturalism, which poses as irreligion, is exclusive. Every religion has its starting points and its deductions, and those starting points exclude. For example, Hinduism has two non-negotiable beliefs: karma and reincarnation. No Hindu will trade these away. In Buddhism, there is the denial of the essential notion of the self. Buddhists believe that the self as we understand it does not exist, and our ceasing to desire will be the cause of the end of all suffering. If we deny these premises, we devein Buddhism. Naturalism teaches that anything supernatural or metaphysical is outside the realm of evidence and purely an opinion, not a matter of fact. Islam believes that Muhammad is the last and final prophet, and the Qur’an is the perfect revelation. If we deny those two premises, we have denied Islam. In the Christian faith, we believe Jesus is the consummate experience of God in the person of His Son, and is the Saviour and Redeemer of the world. We cannot deny these premises and continue to be Christians. The question is not whether these are mutually exclusive. The question is: which one of these will we deny as being reasonable and consistent? Which one of these will we be able to sustain by argument and by evidence? We can have pluralism in cuisine, clothing styles, accents and other things. But if pluralism means ideational relativism and the destruction of the law of non-contradiction, it is absolutely unlivable and unthinkable. It seems some of these different views lack the same degree of logical consistency found in Christianity. ZACHARIAS: Right. In fact, even some of the great sages of these other worldviews agree. Mahatma Gandhi, in one of his writings, stated that he wished some aspects of his own belief system could be permanently erased because so much of it was nonsense. Even Gandhian sages will tell you that. Much of what is in one of the early sacred Hindu writings, Veda, is irrational and unacceptable. We would consider some of the behaviours and practices of Muhammad in his own personal life reprehensible if someone practised them within our culture today. Then compare the whole idea of God in His self-existence and in the very notion of moral rightness. The denial of desire is the foundation of Buddhism, which is the only way that leads to the lack of suffering. Yet the principal reason people give the Dalai Lama prominence is for the freedom of Tibet. I am for that. I agree that he needs to acquire political freedom, but why does he even desire political freedom if he is the quintessential representation of the ultimate Buddha? At times, there may be surface polarized views which are neither absolutes nor can be coalesced in some way. But when there is a systemic contradiction, the system destructs. A secular mindset has invaded the church. What is the result of this for the church? ZACHARIAS: A secular mindset is manifested in some forms—not all forms—of the emergent church. This is a dangerous phenomenon, and some of its protagonists undervalue its end results. When you think that every generation tends to move away from the previous one, some forms of the emergent church today are flirting with the extinction of the gospel, at the heart of which is the cross of Jesus Christ. Two things have happened in the secular mindset. First, secular minded people do not take the church seriously because the church is not answering their questions. Second, those within the church are timid and unable to sustain the supernatural side of their beliefs in a highly naturalistic world. What remains, then, in this kind of religious belief system is a spirituality that does not need to defend itself because it is purely a private thing that does not moralize or pontificate for anyone else. It becomes a feel-good, be quiet, and get a better state of mind at the end of the day religion. Moral absolutes? One revelation from God, who has moral boundaries for us? No, that becomes untenable. So the church, when it did not respond to the secular mindset and did not prepare its own people, became secularized. In the end, it became spirituality without truth, and experience without objective reference. The average church member today is unprepared and ill-equipped to face the attacks that are coming at us full force. We are leaving our young men and women who are attending universities as lambs led to the slaughter. We have fought symptoms, like the issues of the Second World War. We were shooting at rubber dummies while the real attack was taking place elsewhere. How can pastors better prepare themselves and their people to respond to the attacks on Christianity and the critical issues facing Christians today? ZACHARIAS: One of the most difficult positions to hold in the Western world today is that of a pastor. My heart goes out to our pastors. I do not know how they keep up. The competition for the attention of their people is immense: the attack on the visual; the constant distraction of many voices; the challenges of those with huge budgets to keep people in their pews over those who do not have recourse to huge budgets; the incremental growth of knowledge; the incredible vitriolic nature of these attacks; the youth in their challenges and struggles with their finances; and other experiences. It is difficult to keep up with these challenges that are unparalleled and unprecedented in history. My sympathy for pastors is intense. When I visit churches, I feel for them. I pray for them. As itinerants, ministry is a little easier because we can become specialists in what we do. Pastors are still expected to be generalists. How does a pastor cope with these attitudes regarding Christianity and the church? Pastors need to do their best to study and understand the issues before them and their people. They need to work within their comfort zones of response and not be afraid to admit when they are outside of their reach. They have access to books, CDs, debates, seminars and tapes in which specialists ably deal with apologetic material. One of the biggest failings of people such as Christopher Hitchens and Sam Harris is the fact that they are not biblical scholars, even though they have taken on the Scriptures in some areas. For example, Sam Harris attacks the virgin birth as having no basis in the Old Testament because Isaiah uses the word alma. This shows how little he knows about the Hebrew text and what the word possibilities are. Rather than admitting his lack of knowledge, he took it on. Pastors need to say, “I am not a neuroscientist. I do not understand all the implications of genetic engineering, but I know Christians who do. Here are their books.” Pastors need to bring in these speakers and their material, and interact with the experts. This is why our ministry began in 1985. People hardly knew the word apologetics. We had to explain it. Today, our staff is about 125 globally, based in nine countries. We cannot keep up with the invitations. We have to turn down more than 90 per cent of them. Our goal is to expand more for the sake of the gospel and to come alongside the church. This is what we want to do. I hope more ministries will spring up to assist churches and strengthen our young people and our leadership. What do you say to a pastor who says, “Apologetics is just philosophy, and we do not need that. All we need is the Bible”? ZACHARIAS: I desperately wish it were that simple. When pastors believe and teach that, “all we need is the Bible,” they equip their young people with the very line that gets them mocked in the universities and makes them unable and even terrified to relate to their friends. If pastors want their young people to do the work of evangelism—to reach their friends — that line will not get them anywhere. Even the Bible that Christ gave us is sustained by the miracle of the resurrection. The resurrection gave the early church the argument that Christ is risen: we saw, we witnessed, we felt, and we touched. The Apostle Paul defended this gospel. He went to Athens and planted a church there. In Ephesus he defended the faith in the school of Tyrannus. We also need to become all things to all people. If a pastor says, “All we need is the Bible,” what does he say to a man who says, “All I need is the Qur’an”? It is a solipsistic method of arguing. The pastor is saying, “All I need is my own point of reference and nothing more than that.” Even the gospel was verified by external references. The Bible is a book of history and a book of geography—not just a book of spiritual assertions. The fact is, the resurrection from the dead was the ultimate proof that in history—and in empirically verifiable means—the Word of God was made certain. Otherwise, the experience on the Mount of Transfiguration would have been good enough. But the apostle Peter says in 2 Peter 1:19: “We have the word of the prophets made more certain ... as to a light shining in a dark place.” He testified to the authority and person of Christ, and the resurrected person of Christ. To believe that, “All we need is the Bible and nothing more” is what the monks believed in medieval times, and they resorted to monasteries. We all know the end of that story. This argument may be good enough for those who are convinced the Bible is authority. The Bible, however, is not authoritative in culture or in a world of counter-perspectives. To say that it is authoritative in these situations is to deny both how the Bible defends itself and how our young people need to defend the Bible’s sufficiency. It is sad that some people think a person who asks, “Why the Bible?” is being dishonest. This is a legitimate question. On the last day, I sat down with him with a Bible in Hindi, and we talked. Before that hour was over, he bowed his head and received Christ. He had numerous questions on how God could have a Son. People had told him that the Bible was corrupted. He was honest. He needed to know why the Bible is authoritative and can be trusted. He gave his life to Jesus Christ. What a wonderful way to end a three-week journey with my chauffeur—a man in his twenties—who bowed his head, wiped away his tears, and prayed to receive Jesus Christ. Please share a final thought with our readers. 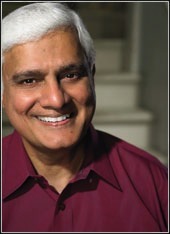 IS THE PRESIDENT OF RAVI ZACHARIAS INTERNATIONAL MINISTRIES.